The 11k hits per day is calculated by Virtualize. This number is incremented every time a Virtual Asset is invoked, and traffic passing through the proxy does not increment your hit count. 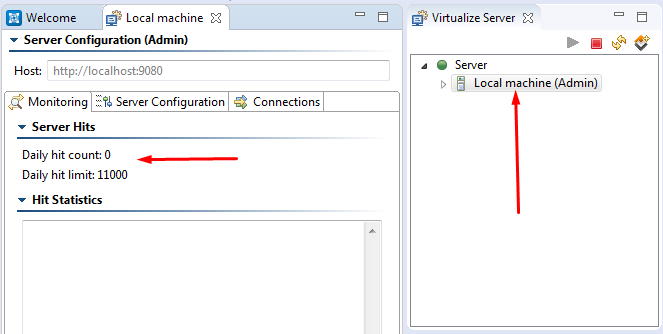 If you would like to know your current amount of hits on your Virtualize server, that number is shown once every 30 seconds in the console view if there has been a change. Additionally, you can double click on the Local machine node in the Virtualize Server view, and this will display your current number of hits as well. Thank you very much, but i have a question? The number of hit is 4 or 2? Each request/response pair will count as a single hit for the server. If you access the LoanProccessor asset with two requests, then it will count as two hits. Thank you very much!!! Solved!!!! Thank you for the question it was very valuable. i am curious if you were able to start your Community Edition and license it with no problems?